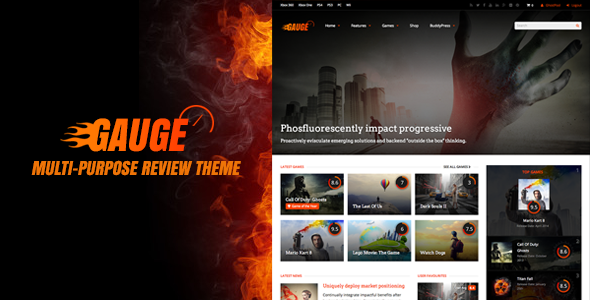 Gauge is a powerful review theme that allows you to create extensive reviews for any kind of content including games, movies, food etc. Each review item has it’s own centralised hub page with tabbed navigation where you can display all the news, videos and images relating to that item. Each item can be reviewed by both admins and users and this all comes packaged in a fully responsive, clean and modern design. Gauge allows users to follow hub items and keep track of latest reviews and posts associated with those hubs. Gauge comes with its own login pop up form so your users never have to see the WordPress login page. It also works seamlessly with the Social Login plugin so your users can login via Facebook, Twitter etc. The theme has been designed to look great with WooCommerce (ecommerce plugin). It also comes with a cart button in the header that shows the number of products added to the cart and a dropdown of the products added. Gauge gives you the ability to add the logged in user’s profile link to your menus and add the BuddyPress notifications counter beside it so users can keep track of who’s sent them a message, friend request etc. Gauge allows you to add leaderboard ads in the header and footer of the site which are fully responsive. We also provide an Advertisement element that allows you to insert ads anywhere within your content or sidebar. Gauge ensures your website looks sharp on high resolution devices by swapping normal resolution for high resolution images and utilises HTML5, CSS3, and icon fonts that don’t distort with larger resolutions displays. Gauge is built with the latest SEO practices in mind. Semantic HTML5 for better search result placement, schema markup of all content, correct use of H tags, main content loaded before secondary content – we have it all covered. Gauge comes with translation files so you can easily translate your site into any language you want. Gauge comes crammed with portfolio options. With multiple column and masonry displays, item filtering, different content positions you have everything you need to showcase your work. Why are icon fonts so important? Simple. They are so easy to use, look great at any size and make your content look that much better. Gauge includes the Font Awesome library to give you nearly 400 icons to use throughout your navigation, paragraphs, buttons, lists, and just about anything else you can think about. 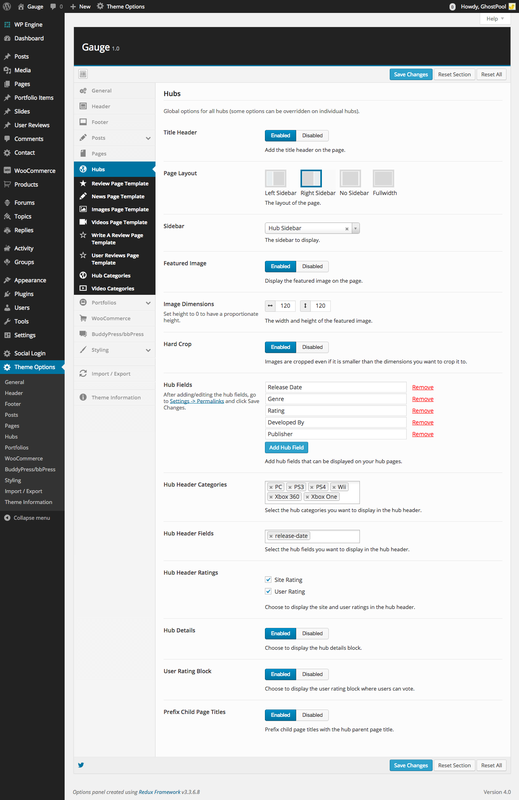 Manage your blog posts better by taking advantage of WordPress custom post formats. The following post formats are included, each with their own unique style and options: Standard, Gallery, Link, Quote, Audio and Video. We offer top notch support which means you will receive detailed answers to any questions you may have quickly. Trouble using the theme? Find a bug? We’ll solve it for you. The theme gives you the ability to change the options on each individual post, page, portfolio item or you can do it globally to change them all at once. Create unlimited sidebars that you can display on any page you want. Comes with a child theme so if you ever want to make any code changes they will not be overwritten when you update the theme. The theme uses the Redux framework which is a simple, truly extensible options framework for WordPress themes and plugins. This allows you to customize the site live using the WordPress Customizer.